Synopsis, Our Opinion: OUTSTANDING Syrah that was both opulent and scrumptious with food. 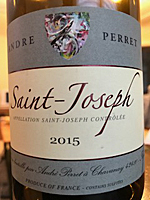 Producer/Winery: Domaine André Perret; Chavanay, France. 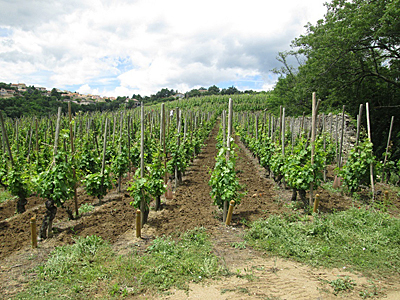 Geographic Appellation: Saint-Joseph; Northern Rhone, France. Paired With: Goat stew with carrots and onions, basmati rice and roasted carrots. Opened one hour before drinking. Opaque, inky dark purple with a lighter purple rim. Gushing damp earth, cherry, raspberry and plum aromas with potent whiffs of crushed walnuts, old barn wood on a damp day and Rosa “Oklahoma” scent. WOW, WOW, smooth, dry, full-body and meaty; ABOUNDING raspberry intertwined with dark cherry flavors, than at mid-palate it became robust and concentrated with a mix of fruit and potent dusty mineral. This continued through an extended length finish where the tannins became more grippy and the taste was more tart and had a licorice flavor as it ended. Balance that absolutely doesn’t get any better and the enthralling mineral background reminded me of the smell and taste of dust when standing alongside a rock crusher that’s being fed igneous rocks. Each sip was like an explosion of mouth-feel and flavors and it paired perfectly with the goat stew. Vicky said “this was a kick up your heels and enjoy it wine” and we cherished every sip!!! OUTSTANDING Syrah that was both opulent and scrumptious with food. Comments: Learn more about André Perret and his wines.